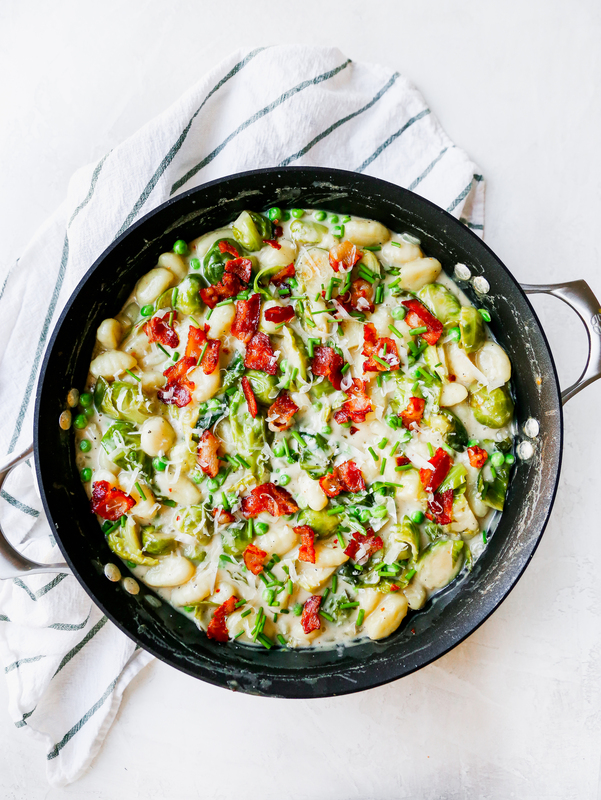 I have been on a one-pan/skillet/pot meal kick lately! Is there anything better than making a mess in only ONE pan? Especially when the dinner is just as good as one that would dirty several? I think not. Today’s meal is no exception. 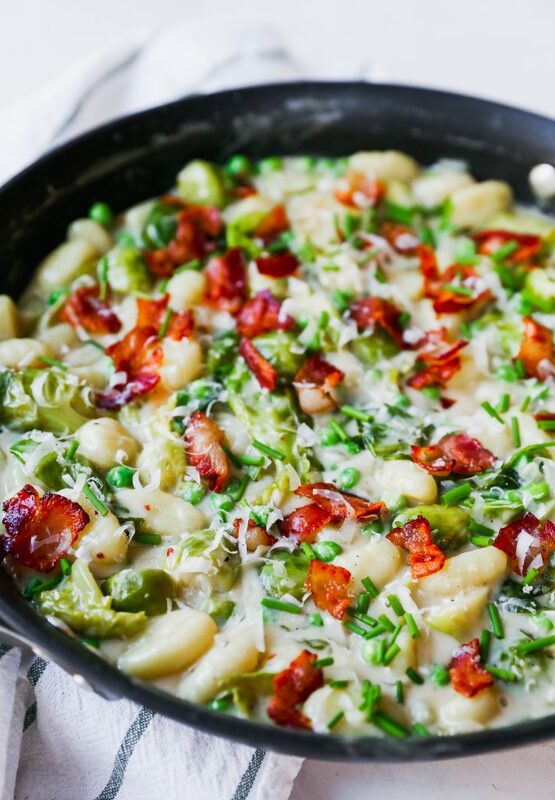 This one-pan gnocchi may have changed the gnocchi game for me forever. The fact that no boiling water was involved makes me happier than it probably should, but I don’t care. 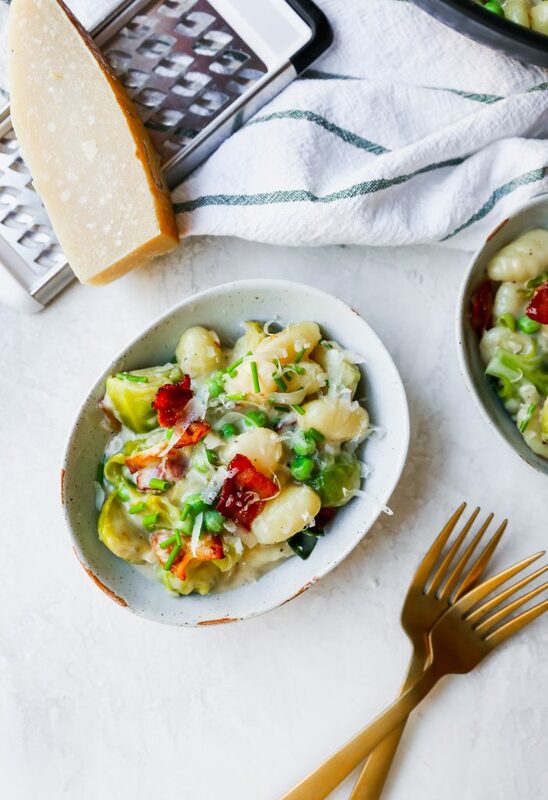 Gnocchi is a great pasta to use for one-pan dishes because it cooks up so quickly and is pretty forgiving as far as texture goes. 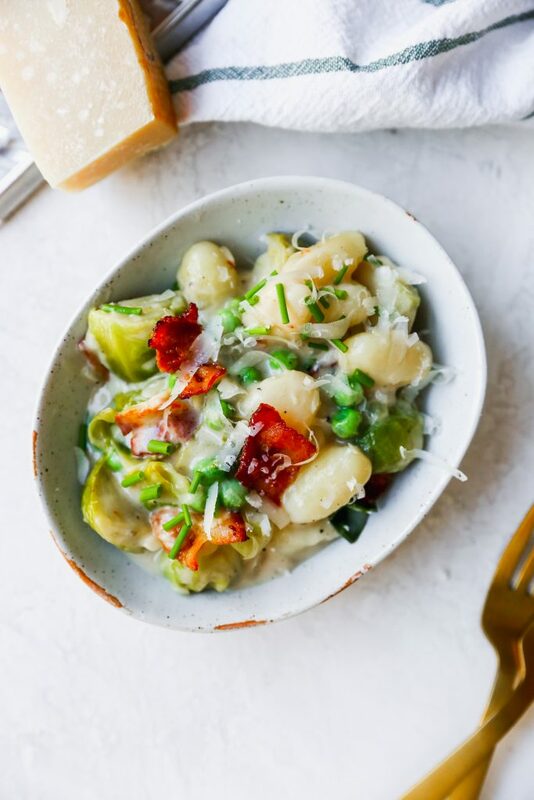 This gnocchi is flavored with all the good stuff. Is there anything else needed in life? Maybe a glass of icy cold white wine, but that’s off limits for me right now, so we’ll just pretend this is the only thing we need. Mmmkay? 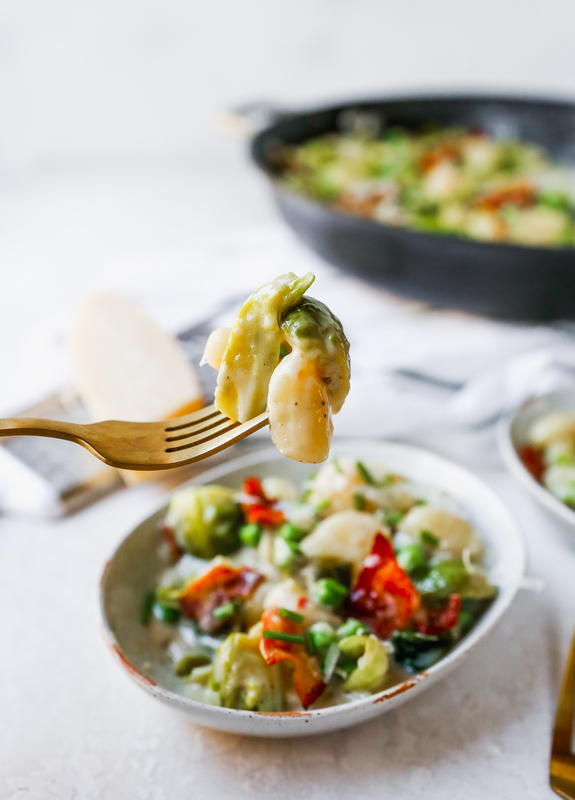 Not only does this dish taste crazy comforting and delicious, but it also comes together super quickly and easily. When I tested this recipe (twice! ), I clocked in right around the 30-minute mark from start to finish. Gotta love that! It all starts with bacon, which means it has to be good, right? Crisp it up and then set it aside for garnishing, because who doesn’t love bacon as a GARNISH. Let’s make that a life goal, shall we? 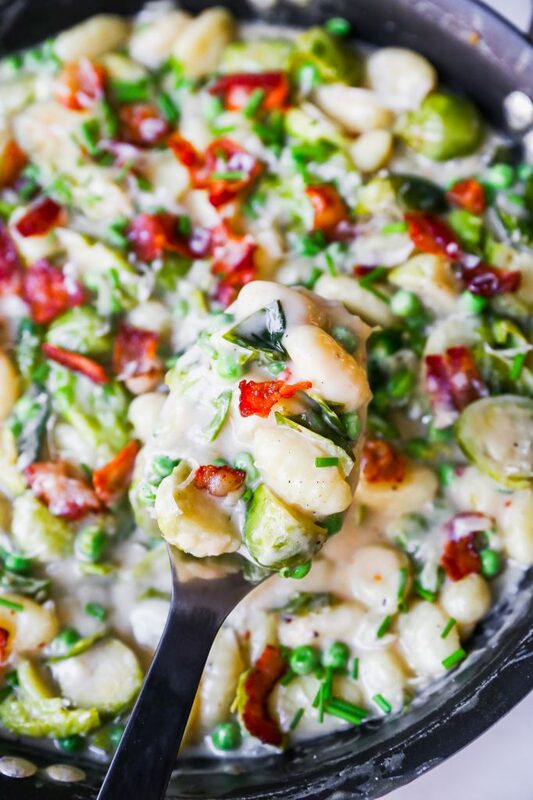 Garnish all the things with bacon. Done and done. Next comes the brussels sprouts, which get sautéed with some onion, garlic, and red pepper flakes right in the bacon drippings. Then, you add some liquid in the way of broth. I used chicken, but to keep this vegetarian, just swap in some veggie broth! Then the gnocchi go in and cook until they are puffed and cloud like. 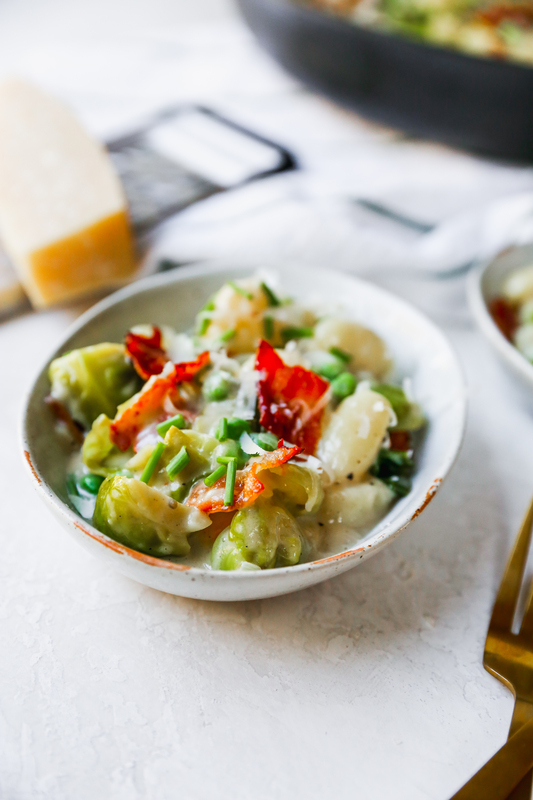 We finish things off with some half-and-half, parmesan cheese, frozen peas, and fresh lemon juice. Simmer for a minute or two until everything comes together and then you are pretty much ready to serve. I like to top this off with the bacon GARNISH, some chopped herbs (I used chives), and another grating of parmesan cheese. Because there is no such thing as too much cheese. 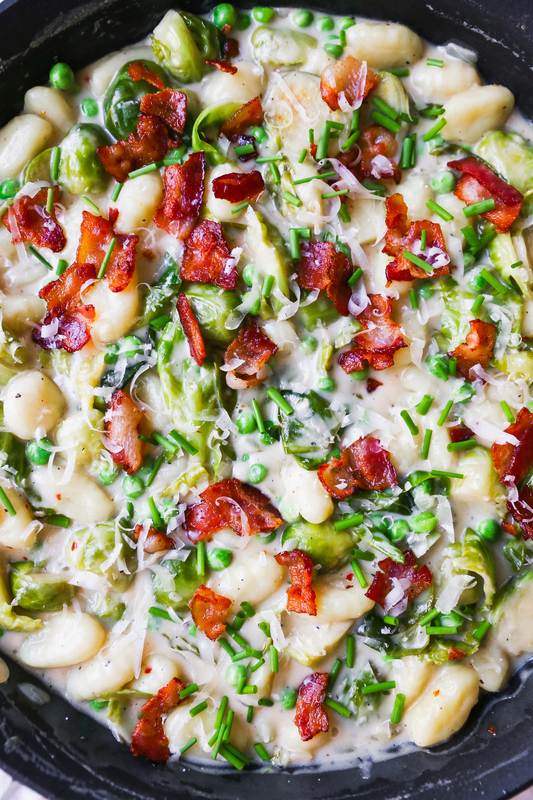 Heat a large skillet or shallow pan over medium-high heat and add the bacon. Cook until the bacon is crispy and rendered. Remove with a slotted spoon and set aside. To the drippings, add the oil. Add the onion and pinch of salt and cook for a few minutes or until the onion is starting to tenderize. Add the garlic, brussels sprouts, red pepper flakes, and another pinch of salt. Cook, stirring frequently, until the brussels sprouts are tender and beginning to caramelize in spots, about 10 minutes. Slowly add in the chicken stock, scraping up any brown bits on the bottom of the pan. Bring the stock to a simmer and then add in the gnocchi. 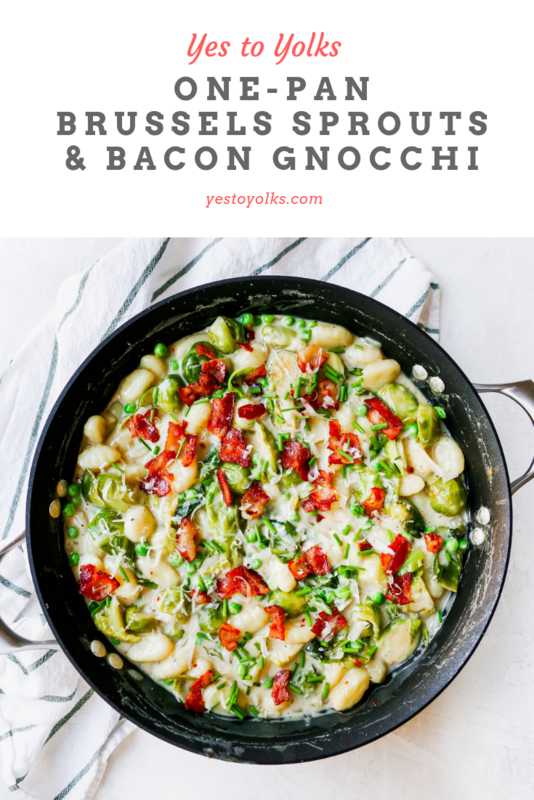 Cook, stirring frequently, for another 5-7 minutes or until the gnocchi is almost cooked. Add in the half-and-half, peas, cheese, and lemon juice and stir constantly until the liquid reduces a bit and thickens up. Add the crispy bacon back to the pan and stir to combine (feel free to reserve some for topping when you serve). Season, to taste, with salt and pepper. Serve immediately, garnished with chopped fresh herbs.